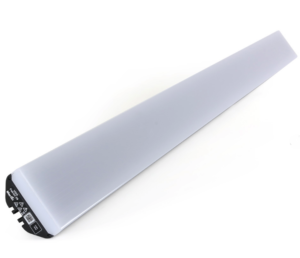 VDO Fatron – 20 is a 20 mm pixel pitch outdoor-rated LED video batten with an extensive range of optical accessories for a wide variety of looks that allows you to play with creativity in 3D stage designs. Easy video-mapping and creative mix ‘n’ match with other Martin LED video products via the P3 System Controller. It uses the same integrated power and data cabling as VDO Sceptron and VDO Dotron. It is supported by integrated power and data processor (P3 PowerPort 1500 or P3 PowerPort 1000 IP) and a simple cabling system. It uses P3/DMX/RDM controllable (automatic protocol detection) and has an extensive range of built-in effects. Fully brightness and color calibrated for optimal consistency between products (colors matched with VDO Sceptron and VDO Dotron). The unit has 8 different diffuser options plus 1 lens option (all field-exchangeable) and is IP65 rated for outdoor use and available in two lengths: 1000 mm and 320 mm. 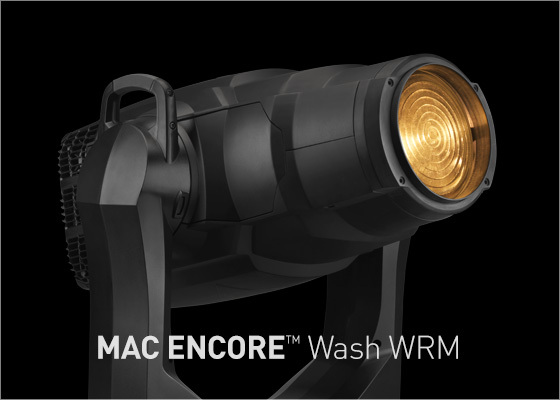 Mac Encore Wash – Designed to produce rich color and premium white light in a wide variety of applications where light quality is critical. The feature-packed soft edge moving head comes in two separate color temperatures 3000 K and a 6000 K crisp, neutral daylight. Both have a fully electronic dimmer/shutter control with various dimming curves and tungsten red-shift emulation. Vibrant CMY color mixing with a superior palette of colors ranging from rich, saturated primary colors to light and smooth pastel shades. Variable CTB and CTO filters and 6 interchangeable dichroic filters + open. Fresnel lens: 1:4 zoom precise, silent and fast zoom. Internal barndoor system with two shutter blades and iris. Shutter blades can overlap for full blackout and the entire system rotates +/- 100°. Repeats cues with great precision. Precise and tight iris with adjustable dynamic effects. 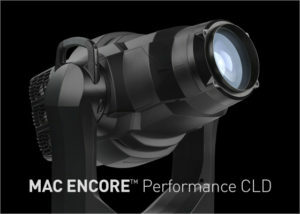 Animotion™ FX System, internal dimming effect macros for stunning 3D mid-air and projection effects. Super precise and silent pan/tilt movement and positioning due to 3-phase stepper motor technology and absolute position monitoring. Mac Encore Performance – moving head offers 6000 K neutral daylight. 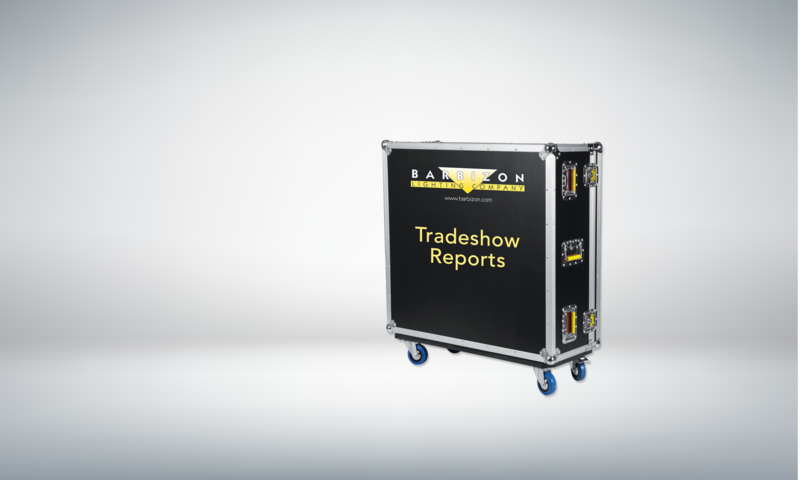 It contains a full color mixing system as well as a fully variable CTO/CTB depending on the model selected. Both include a flat field without color temperature variation during zoom and dimming. Their flicker-free operation is based on an LED driver frequency suitable for all camera applications. Both fixtures create minimal noise by combining convection and forced air cooling with user-selectable output vs. sound level control. Vibrant CMY color mixing with a superior palette of colors ranging from light and smooth pastel shades to rich, saturated primaries can be found on board. Variable CTO, CTB, and 6 interchangeable dichroic filters + open come as standard. 1:4 zoom—precise and fast, silent zoom with auto-linked focus. Four framing shutter blades with individual +/- 30° adjustment and entire system rotation of +/- 55° allow for high-precision cues. Five rotating glass gobos with next to zero focal separation from the framing system. Animation wheel with continuous multi-directional rotation and indexing with a variable angle, speed, and direction. Animotion™ FX System—internal dimming effect macros for stunning 3D mid-air and projection effects. Precise and tight iris with adjustable dynamic effects. A soft frost is included that leaves gobo artwork and framed images visible with a beautiful soft edge. Super precise and silent pan/tilt movement and positioning due to 3-phase stepper motor technology and absolute position monitoring.